Stepan Company was founded in 1932 and is headquartered in Northfield, Illinois. Stepan is a global manufacturer of basic and intermediate chemicals, including surfactants, specialty products, germicidal and fabric softening quaternaries, phthalic anhydride (P.A. ), polyurethane polyols and special ingredients for the food, supplement and pharmaceutical markets. Writing for this company required me to learn about these products and processes in order to create articles that are understandable and accurate to industry insiders as well as non-technical readers. The 2015 Annual Report was published in mid-2016. I was hired to write the letter to shareholders from the company's president and chief executive officer, and its chairman. I was also responsible for the feature article, "Adapt - Build - Succeed." 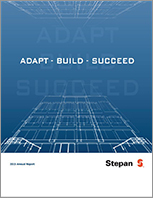 This piece is the culmination of 11 indepth interviews with key Stepan managers and project leaders.